Automating your expense management is a relatively simple project that will save your company many unproductive manhours because employees no longer have to deal with tedious expense reports, yield an ROI of up to 500 percent and increase your employees’ happiness. 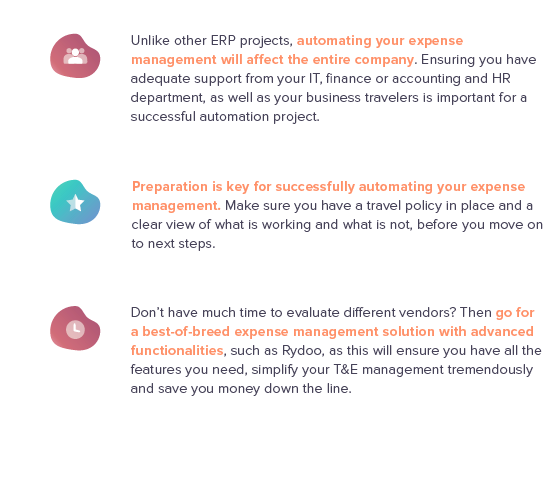 Choosing the right travel & expense (T&E) tool, however, is crucial as a good fit between your T&E solution and your company’s needs will be strongly correlated with the success of your expense management automation. Reading this guide is, therefore, the first and most important step in improving the way your company deals with expenses. This whitepaper will guide you through the process of preparing, choosing and implementing an expense management solution. With more than 1.3 trillion USD spent last year on corporate travel worldwide (GBTA, 2018), travel expense management is becoming increasingly important for most companies. Corporations are actively trying to gain control of their travel and expense budgets, and expense management tools are on the rise. This shouldn’t come as a surprise, as submitting, controlling and analyzing expense report data is a time-consuming and tedious task for employees as well as finance departments, that can easily be completely automated by T&E solutions. all resulting in a huge decrease in costs and a great return on investment (ROI). We will go through each step in detail in the remainder of this whitepaper. Preparation is key for selecting and implementing an expense management solution successfully. Gathering as much information as possible from key people in your organization will not only allow you to select a T&E solution that is a perfect fit with your company’s needs, it will also ensure a smooth implementation of the tool. We listed five key steps that will ensure you get all the information you need for a successful project, from start to finish. • Get a clear view of your current travel and business expense policy. Not only will your expense policy help you decide which expense management solution will be a good fit with your company, your TEM vendor will also need this information to customize their expense management tool to your company’s needs. Don’t have a clear travel policy? Then this is the perfect time to create an unambiguous and workable policy for all your employees. Make sure, however, that your expense policy is up and running before you move on to later steps of this guide, as creating a workable policy for travel and business expenses while selecting or implementing a TEM solution will delay the project and affect its success negatively. • Define the problem(s) you want to solve. • Travel policies that are unclear or confusing for employees. • Time-consuming process for traveling employees and finance and accounting departments. • Late reimbursement of expenses paid by employees. • Incorrect employee expense reports. • Expense fraud by employees. • Unstructured and non-transparent data. • Difficulties in processing expenses in accounting software. • Difficulties with compliance with local rules for multinational companies. • Talk to relevant people in your organization. Your IT, finance/accounting and HR department are key players in this project and will have to be involved heavily. Make sure you understand their work processes when it comes to expense management, what they want to see improved and how. • Finance/accounting are typically the main responsible departments for managing T&E. The exact division of roles differs between companies, but these departments typically approve and control expense reports, include the expenses in the accounting books, budget for future travel and analyze expense data. • HR is typically responsible for reimbursing expenses employees paid out of pocket and employee happiness. Both will improve greatly when using a good TEM tool: reimbursing expenses can be automated, while employees will no longer be frustrated when collecting receipts and filling out tedious expense reports. • IT is typically responsible for maintaining the software the HR and finance/accounting departments use, ensuring data can easily flow between different programs and resolving issues and troubleshooting problems. Some key questions to ask these departments are: What are your departments’ information and reporting needs? How is T&E data being analyzed? What kind of data and reports are lacking? Which workflows would your finance/accounting department like to see improved? Which information does HR need to reimburse your employees (faster)? Of course, don’t overlook the people that will be using your TEM solution the most: your traveling employees! Make sure you also understand what is important to them. Digital security company Irdeto did a great job of involving its employees in the process. Their project team conducted a survey on several employees to learn about their process when it comes to filing expenses, frustrations with the previous system and must-have features for the new platform. This step helped them fine-tune their list of requirements as well as increase the adoption rate of the new tool as they implemented a platform that answered the needs of the users. • Understand your technology needs. How many employees submit expenses each month? What technologies such as your ERP suite, HRM modules or accounting software should integrate with your TEM solution? And how can this be done? Is storing travel and expense data in the cloud an issue? Are there extra security issues or particularities of systems you are using you should be aware of? • Understand your features needs. Different TEM tools offer different features. While some online expense management tools may be free, they also offer very basic functionality only. Best-of-breed solutions, such as Rydoo, on the other hand, offer features such as advanced OCR technology to “read” receipts and automatically pre-populate expense lines, mileage and per diem calculations, compliance with local regulations, the option to go completely paperless, a mobile and desktop app and offline mode. Make a list of all features that are important for your business and your employees, and use this list when evaluating the different TEM solutions. Do you want to estimate your potential cost-savings more exactly? Then don’t forget to add extra costs associated with errors in expense reports, expense fraud, duplicate entries, currency conversions, non-compliance with company travel and expense policy, etc. Our whitepaper “The Return on Investment of Automating Your Travel & Expense Management” looks at this in more detail. Don’t know these numbers for your company? PayStream Advisors (2017) has estimated that the total average cost of submitting an expense report manually is $26.63, while a fully automated TEM tool such as Rydoo cuts this cost down to a mere $6.85. How much your potential cost-savings and ROI will be exactly, will depend on spending patterns in your company, workflow processes, the number of traveling employees, company revenue, employee adoption rate of the TEM tool and the degree of automation your TEM tool of choice will offer. On average, the most popular TEM solutions have a pay-back period of 6 to 17 months (G2Crowd, 2018) and with Rydoo, returns on investment of up to 500 percent are not uncommon. Do you expect travel expenses or the number of traveling employees in your company to grow strongly in the coming years? Then don’t forget to take these forecasts into consideration when comparing different pricing plans. As your accounting and finance department will be impacted greatly by an expense management solution, make sure they are aware of and prepared for the change. Ensure you have adequate resources and commitment from these departments to assist in the implementation of the system. Automating your expense management is not a traditional project during which the vendor does most of the implementation. The TEM vendor might assist you with the system integration work, but it will need your active participation to customize the solution to your company’s travel policy and reporting needs. Moreover, automating your expense management can only be successful if key people in your accounting and finance department are convinced of and happy with the chosen solution. It is therefore imperative to not only understand their needs but actively involve them in the project from start to finish. With more than 100 software vendors offering a TEM solution (Gartner, 2015), choosing an expense management tool can seem like a daunting task. However, with so much choice, it also means you can find the perfect tool for your company’s needs for a good price! Spending some time and effort in choosing the right TEM application for your business will save you lots of headaches, frustrations, time and money down the line. The right travel expense management tool will make the entire process hassle-free, will be easy to use for your traveling employees, will produce relevant reports for your finance department to track and monitor expenses, will integrate perfectly with the software you already use and will have a great return on investment (ROI) by reducing the time your employees need to spend on unnecessary tasks. Write down a list with selection criteria that are important for your company, based on the information you collected in step 1. Check how possible expense management solutions score on your selection criteria. Ask TEM vendors for extra information if necessary. Make a shortlist with candidates that are a good fit with your company’s needs. Ensure that these expense management solutions are scalable and will suit your business both now and in 5 years’ time. Compare features, prices and user reviews of the different candidates on your shortlist. Forward all this information to your task force and ask their opinion. Narrow down your shortlist to two or three candidates, and make sure you understand their product well. Talk to these vendors, request a demo or free trial and get your task force to do a test-drive. Congratulations! The hardest part is over, you have signed a contract with an expense management tool provider. Now comes the most exciting part: implementing and using your brand-new tool. To make sure the implementation goes smoothly, it is best to prepare it thoroughly. Depending on the size of your company, implementation can take hours or months. Make sure every person involved in the project has a clear vision of what should be done when – this applies to people in your organization as well as your supplier. Make sure you know what information your vendor will need to customize their expense management tool to your needs and provide it on time. While smaller companies tend to roll out their expense management automation project at once, large enterprises often work with different waves of implementation or first run a pilot project, after which they implement their TEM solution throughout the entire company. Not only will this pilot phase help iron out any kinks in your implementation or training you’ve set up for your teams, but it will also provide you with an enthusiastic pool of ambassadors that will help your organization make the change more easily. Make sure to support your pilot team and provide them with all resources they could need to start using the tool, such as how-to guides, training sessions or explanation videos and a way to get in touch with your TEM vendor in case of questions or problems. Gather their feedback, make adjustments and use this opportunity to ensure your full launch goes as smoothly as possible. Regardless of how you decide to implement your expense management tool, it is key to get your employees on board. As high adoption rates are crucial to the success of the entire project, it is important to get your employees excited about the new tool. Whether you communicate via email or during a lunch & learn session, make sure you show the change is backed by senior executives and share the reasons for the change and the benefits this will bring to the employees and the company. This will help them be more open to the change. Moreover, implementing a TEM tool could be the perfect opportunity to show your employees how the company is embracing digital and how it’s a modern organization that cares about the welfare of its employees and wants to make their life easier. While in some companies an email might be enough for users to adopt a new tool, other companies might want to host learning sessions to make sure everyone is on board. When using Rydoo, the sessions to teach business travelers how to use the app can be short and sweet, as the app is very intuitive and easy to use. Make sure people download the app and try it on the spot. This way you can make sure that you answer all questions and that the first experience with the app is successful - even for less tech-savvy employees. For your finance or accounting department, it might be useful to host a couple of training sessions to show them around in the new platform, how to extract data and how to analyze insights. This way, you can ensure there is a smooth transition, and your finance or accounting team will take advantage of having real-time expense data and insights. While not necessary, this last step will ensure you get the most out of your TEM tool and you maximize your return on investment. An ideal timeframe for this last step is three to six months after the implementation of your solution is completed. This way, most employees have gotten used to the new tool, whether they are business travelers, finance or accounting employees. Firstly, evaluate the expense management solution you have chosen. Did the tool solve all problems outlined in step 1 in a satisfactory fashion? What is the adoption rate of the tool and are your employees happy using it? How is the integration with the accounting or reimbursement software in practice? Did reimbursement periods or compliance rates with company travel policy improve? Secondly, sit down with your finance or accounting team and review how they use the data your expense management solution produces. Do they use the data? What are some insights the tool has produced and how have they acted upon these insights? Finally, reevaluate your travel policy. If the implementation of your expense management solution has been successful, you now have a great deal of extra insight about how your employees travel and how they spend money while traveling. These insights can help you finetune your travel policy. What are the types of expenses that get rejected? What are the reasons for rejection? Are there certain hotel chains or airlines your employees use often? And could you negotiate a better corporate rate with said chains or airlines now that you have a better overview of the amount of business they generate through your company? Automating your expense management is a simple project that can nonetheless have high rewards. A TEM solution will save your company many unproductive manhours because employees no longer have to fill in tedious expense reports, reduce expense errors and even expense fraud, and increase employee happiness and retention rates. All these factors together make automating your expense management a project that can easily yield an ROI of up to 500 percent or more. Choosing the right T&E tool, however, is crucial as a good fit between your T&E solution and your company’s needs will be strongly correlated with the success of your expense management automation. Preparing the automation of your expense management well is therefore important. Make sure you have a travel policy in place and a clear view of what is working and what is not, before you move on to the next steps. Unlike other ERP projects, automating your expense management will affect the entire company. Ensuring you have adequate support from your IT, finance or accounting and HR department, as well as your business travelers is important for a successful automation project. Don’t have much time to evaluate different vendors? Then go for a best-of-breed expense management solution with advanced functionalities, such as Rydoo, as this will ensure you have all the features you need and save you money down the line.